3.5 stars. Huh. I think I just finished a Rachel Vincent book and had a moment of confusion in thinking that I had read something from another author completely.Am I complaining? Kind of... Crap. I'm sorry. This wasn't supposed to happen because I adore Ms. Vincent. However, I do have more positives than negatives to say about Blood Bound. Actually, I was somewhat impressed with Blood Bound. 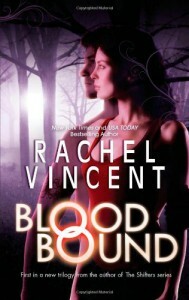 It just felt extremely odd that I didn't recognize Rachel Vincent in this book. At all. And I kind of missed that.One of my favorite things about this particular author is her ability to create characters whom I fall deeply and almost obsessively in love with. Her Shifters series even had me appreciating much of the supporting cast and minor characters. In fact, I cried hard over a scene involving one of the side characters. As for her Soul Screamers series, I'd only read the first book, but I was digging on those characters too. So what the heck happened here with the Unbound series?? ?Olivia (Liv) - She was a cool chick. She fit the standard UF profile - badass girl who puts her own life in danger to protect the people she loves. Back then, I would have looked the part - harmless, vapid young woman who needed jumper cables, or a telephone, or a big, strong arm to open a jar of pickles. Anything to get close enough to use a Taser on the target and collect a paycheck. "Hey, sorry to bother you so late, but-" I let my right arm fly, and my fist smashed into his nose.Outside of that, I don't think we really found out anything else about her. Boo to that.Cam - Is it sad that I was almost hoping for a love triangle? Yep. The world has tilted on its axis if I'm looking around and hoping for another guy to come out of the woodwork. I didn't see any of the appeal of Vincent's previous males, such as the fiery temper of Marc, or the sweet puppy dog appeal of Jace, or the fun passion of Ethan. I will go on record as saying that Cam was pretty awesome near the end of the book but it didn't make up for something he did to Liv previously. He still has a long way to go before he earns my seal of approval. Let's hope the adventures of Cam and Liv in book 2 will take the chemistry up a notch. *edit* to add that I (for once) wasn't a fan of the dual PoV. For some reason, the characters sounded too much alike and it confused me, making me forget that I had transitioned between characters.Nevertheless, Blood Bound was a decent intro for an Urban Fantasy series. This did fall into the first book syndrome of too much info dumping right off the bat, but I'm used to that by now with most UF worlds. All in all, the groundwork of the world and politics are pretty intricate in a good way and I can't wait to see more of what's to come. Mafia style feuds rock my reading world. Much like I love Holly Black's Curseworkers series, I found similar reasons to gravitate toward this new Unbound series. Humans performing dog and pony tricks with the aid of special abilities is just cool. In fact, it's most definitely more cool than watching some otherwordly being who views magic as old hat.I heard book 2 is even better. This is great news. I'll definitely be checking it out.